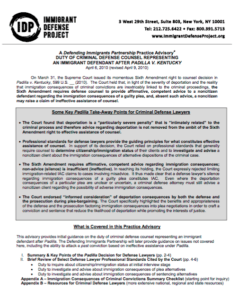 This Saint Louis University Law Review article addresses the expanded role of prosecutors relating to various civil consequences of criminal convictions, including immigration consequences, subsequent to the 2010 U.S. Supreme Court decision in Padilla v. Kentucky. 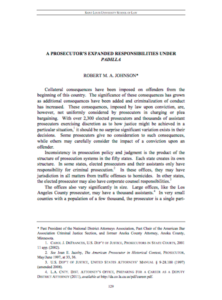 The article was authored by Robert M. Johnson, past President of the National District Attorneys Association, past Chair of the American Bar Association Criminal Justice Section, and former Anoka County Attorney, Anoka County, Minnesota. As courts and prosecutors around the country consider what role they should play in ensuring that defense counsel comply with their obligations post-Padilla, judges should refrain from asking about defendants’ citizenship/immigration status and prosecutors should refrain from asking judges to do so. This advisory was prepared by the NYU Immigrant Rights Clinic in collaboration with the IDP.